When analyzing either experimental or calculated data, it is common to have the need of getting mathematical models. This can present several scenarios where the most common data fitting techniques could not characterize the data accurately. One of these scenarios is when the distribution of data on the scale of the independent variable X is not uniform, for example, the power range of an electric motor when trying to model the temperature of the case. This case is especially difficult to model with a polynomial as the data found on the limits of the available range will be affected in their prediction for the location of other data and the degree of the polynomial chosen. An easy option to obtain a mathematical model of this type of data is by cubic splines. A spline is a special function defined piecewise by polynomials. In interpolating problems, spline interpolation is often preferred to polynomial interpolation because it yields similar results, even when using low-degree polynomials, while avoiding Runge's phenomenon for higher degrees. A cubic spline is a spline constructed of piecewise third-order polynomials which pass through a set of control points. The second derivative of each polynomial is commonly set to zero at the endpoints, since this provides a boundary condition that completes the system of equations. This produces a so-called "natural" cubic spline and leads to a simple tridiagonal system which can be solved easily to give the coefficients of the polynomials. Cubic splines can be calculated using different mathematical software. One of them is JMP® STATISTICAL DISCOVERY SOFTWARE (www.jmp.com). It includes a user friendly graphical display to adjust the lambda stiffness parameter, until the user reach the desired prediction level. 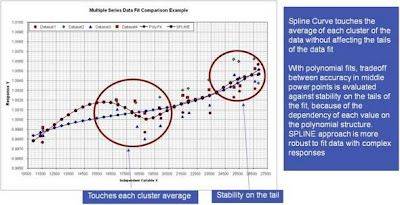 Should you have any question or comment, don’t hesitate to contact TeraSigma for consultancy regarding Cubic Splines and other data fitting techniques.